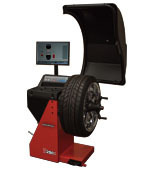 The B2000P is the only automated diagnostic wheel balancing system that offers touchless measurement and analysis. Automatic inputs remove the chance for error and inaccurate results. 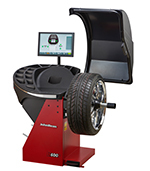 When combined with precise wheel balancing, the Runout Force Vectoring (RFV) diagnostics assure uniformity based total ride quality. 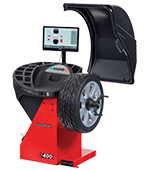 The B1200P wheel balancer with diagnostic functions for tire shops, garages and car dealerships with high tire service volume. With touchscreen monitor and automatic non-contact data entry. Unbalance measurement and run-out diagnosis are performed in a single fast measuring run. 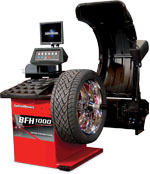 The BFH 1000 is the most advanced diagnostic wheel balancing system in the industry. 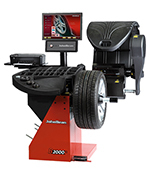 Designed for power users and high-volume shops, the John Bean BFH 1000 wheel balancer boasts one of the fastest floor-to-floor time in the industry, and also provides advanced diagnostics, such as Radial Runout, Wheel-Only Runout, Tread Depth Laser Detection and much more. 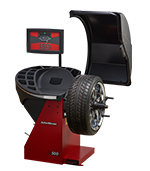 B800P with its automatic balance measurement reduces the time it takes to train new technicians as well as speeds up the time constraints on completing a tire change and balance procedure. From car dealerships to independent garages, the touchscreen interface will make it easy for technicians to easily see the numbers. When the operator touches the amount of imbalance the wheel automatically indexes to the correct position for weight placement. 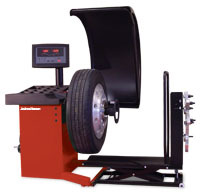 The John Bean B600 series wheel balancing systems are the ideal solution for high-volume workshops featuring short balancing cycle, fast data entry and easyWeight. The John Bean B500 is the ideal solution for high-volume workshops featuring short balancing cycle, fast data entry and easyWeight. The John Bean B400L is the ideal solution for high-volume workshops featuring a short balancing cycle, fast data entry and easyWeight. 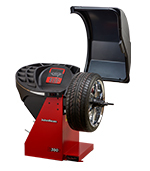 The John Bean B300S high performance wheel balancing system is ideal for high-volume workshops featuring short balancing cycle, fast data entry and easyWeight. 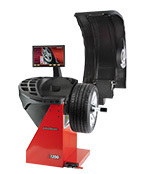 The John Bean B200S high performance wheel balancing system is ideal for all shops - small footprint complimented by the video display provides high- end features in a compact design. In under ten seconds, the color display shows the location of any imbalance and identifies the optimal tape on or clip- on weight location. The John Bean 9800 wheel balancer meets the heavy-duty wheel balancing needs of todays shops. It is designed to balance truck, bus, RV and automobile wheel and tire assemblies. The John Bean 9800 heavy-duty wheel balancer is capable of handling wheel ranges from 12" to heavy-duty 24.5" and also "super-singles".